Please take a close look between the left timber area and the bell. There is a very apparent sharply struck "hook" in that area. Thanks for all comments/opinions. Bicentennial clashes are actually not that totally uncommon. That is the area of the reverse that exhibits them the most. I think it might have been Brian who had a fantastic bicentennial clash a few years ago. 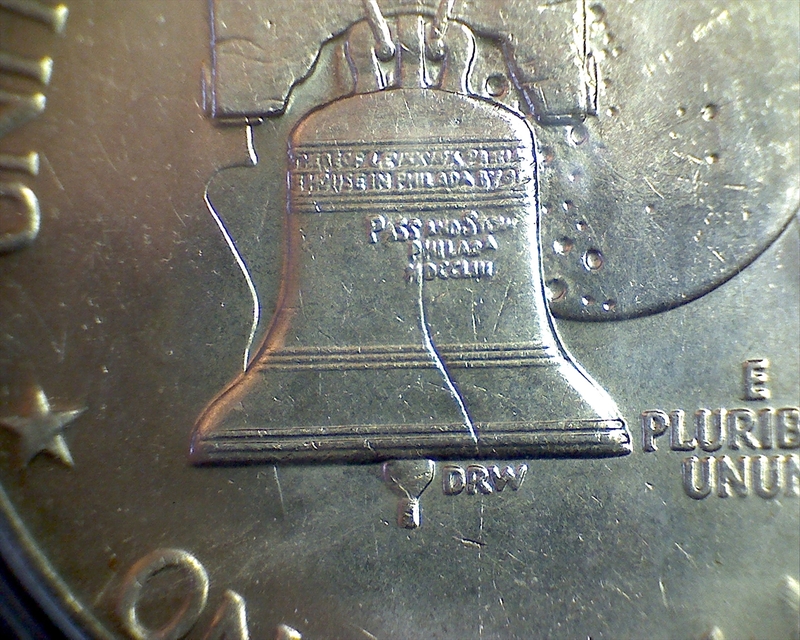 It was a totally unabraded outline of Ike on the reverse around the left side of the bell yoke (the big wooden thing that the bell is strapped to). This one looks untouched, as it probably wasn't readily noticed by the Mint employees in that area with other relief work present. Good eye to catch it, many clash collectors overlook bicentennial Ikes. I've been collecting Ike's for a few years and recently picked up Rob's book and kicked my game up a notch. I've been reading up a bit before posting and figured it was finally time to speak up. I came across this same 1976-P clash in an E-Bay roll I picked up last week. The Ike is at least MS60, possibly as nice as as MS62. After comparing the clashed position to the corresponding obverse it seems to match up to the area around Ike's mid-neck area, so the usual alignment found in the established Ike clashes don't seem to apply here. 1. What area on the obverse caused this clash? 2. How common is it? I own 112 1976-P Ike's and this is the only example of this clash I've found. As you can see, the clashed coins that I have do not have the feature that is shown on the coins depicted earlier in this thread. The feature in the earlier coins does appear in the lips area. I just can't see exactly what would create the feature. With that sharp of a "hook", it has the be the crook of the mouth or where the lips meet. Nothing else really makes sense if clash related. I'm curious if any of the clashes posted have the E from WE showing. My most evident clashed have the E and the clearer the E, the better the overall clash. Irish2ice wrote: With that sharp of a "hook", it has the be the crook of the mouth or where the lips meet. Nothing else really makes sense if clash related. I agree re: the source possibly being the spot where the lips meet. I don't recall seeing the E on the two that I posted. 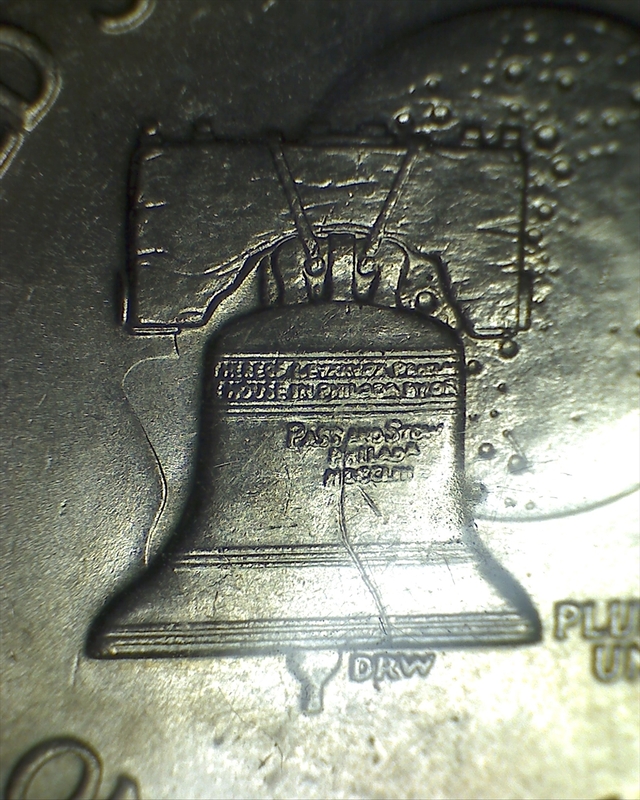 However, both have some chin clash above the yoke on the reverse, and both have the bell clash on the obverse. OK, so I wasn't totally convinced of a pair of lips for two reasons until I superimposed the inverse of the obverse against the Bicentenniel reverse. First, the incuse-relief had me stumped, but later made sense once I realized I was thinking 'planchet transfer' not 'die transfer'. The location also seemed slightly off but I didn't consider anvil die rotation. So yeah, after a little experimentation using Microsoft Paint I does look like my Ike is an upper lip clash. MichaelM wrote: So yeah, after a little experimentation using Microsoft Paint I does look like my Ike is an upper lip clash. Can you post your work for us? I'd love to see it. I just checked mine and mine does NOT show the E from WE as mentioned. Sorry for the delay. So what I did was find a pair of 1976 Ike images on Google Images (obverse and reverse side within the same picture for exact scale). I saved them to my desktop, then opened them in Microsoft Paint, separated them, and then used the 'Flip Vertical/Flip horizontal' function on the obverse image to get an upside-down/mirror image. Then I resized both images to 150% to where each image just fit onto a standard 8 1/2 x 11" sheet of paper and printed them out. I then cut out both images out, put them together appropriately, and held them up to a bright light in order to see both images superimposed. In the first image below I have lined up the "lip clash" positions perfectly with the lips on the obverse coin image. In order to match up the positions though the coins will not align perfectly from about 1 o'clock to 5 o'clock as what is generally found on non-Bicentennial clashed Ikes. Out of curiosity I lined up the positions of Steve's nose clash example that he linked above and found that clash to be similarly misaligned from 11 o'clock to 2 o'clock, but to a lesser degree. Thus die anvil rotation doesn't seem to be what's going on as I stated previously if I understand that process correctly. ! ?